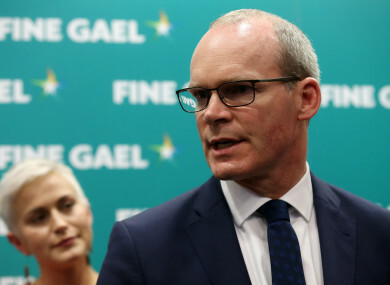 TÁNAISTE SIMON COVENEY has said there have been no formal discussions with the European Commission about how to prevent a hard border in Ireland, though he said they have “thought about” it. Pressure has been racketing up in the last week with a strict deadline of dates being given to UK Prime Minister Theresa May to get a deal done. As the clock ticks on, the big questions about border infrastructure in a no-deal scenario are still largely unanswered. Asked whether the EU Commission has thought about such a scenario, Coveney answered that there have certainly been “conversations around this, but there has been no formal discussion or negotiation as to how it would work”. He went on to state that whether there is a deal or no-deal, the way to resolve the border issues will be some form of regulatory alignment. Even in the British paper which was published, which we didn’t have any input into, they’re effectively talking about the all-island economy not being interrupted by any form of checks. I think thee But we haven’t had any interaction between all three parties because we still advocate for the solution that we know works which is the backstop as the fall-back position unless we can negotiate a future relationship that is so comprehensive that it doesn’t involve border infrastructure. I think our position has been very, very consistent on that. The Tánaiste went further in stating that “in fact arguably I would say the British Government has the prime responsibility here, because of course it is British government policy that has led to this challenge in the first place, insisting on leaving the customs union and the single market, which of course shaped the design of the backstop in the first place, which is as much a British creation as it is an EU one”. In a no-deal scenario, discussions with Britain, Ireland and the EU will have to take place. “There will need to be a solution on the border question, we know that a backstop is the only solution that works, so there will be an onus on all three parties to work together to find a way of preventing a physical border infrastructure which causes unnecessary tension between the two jurisdictions on the island of Ireland,” he said. The Tánaiste would not be drawn on the issue of a special taskforce being set up to deal with the possibility of a hard border. This follows reports that German Chancellor Angela Merkel asked EU chief Brexit negotiator Michel Barnier to examine backup plan to uphold the Good Friday Agreement in a no-deal situation. The Taoiseach has insisted a specialist taskforce has not been set up to address the issue of the border. Coveney said the questions are the same even in a no-deal scenario. “We still have to protect a functioning all-island economy that reinforces a peace process. Northern Ireland is part of the UK and that’s not changing but we have to find a way of protecting the EU single market and a the same time preventing physical border infrastructure,” said Coveney. Email “EU Commission, Ireland and the UK 'have thought about' border issue, but no formal discussions”. Feedback on “EU Commission, Ireland and the UK 'have thought about' border issue, but no formal discussions”.